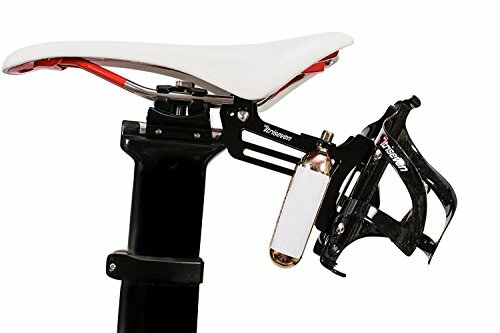 TriSeven Premium Cycling Saddle Cage Holder - Lightweight for Triathlon & MTB, Holds 2 Water Bottles & 2 co2 Cartridges | Does NOT Include Water Cages! - lightweight aluminium aerodynamic Triseven saddle cage holder.  EASY INSTALLATION: Quick & simple to mount to the frame of your bike, leaving more time for riding! PLEASE NOTE: This product DOES NOT come with Water bottles, cages or C02 cartridges.  PERFORMANCE DRIVEN: We develop all of our TriSeven gear with your riding experience in mind. Our Saddle Cage is perfect for training and both half & full triathlons and Ironmans!  PREMIUM DESIGN: Lightweight aluminum build makes this Saddle Cage extremely aerodynamic. Allows for adjustable angles from 0 or 25 degrees; compatible with wide range of saddles. PLEASE NOTE: This product is designed for professional cycling and IS NOT compatible with full-suspension MTB, however, it WILL fit Hardtail MTB.  PERFECT SIZE: Ultra lightweight at only 89g! Capable of carrying 2 bottles or one. May also cary tire tubes, tools and 2 CO2 cartridges.  100% SATISFACTION GUARANTEE - Absolutely LOVE our cycling gear even more than we love making it, or you'll get your money back with no questions asked! If you have any questions about this product by TriSeven, contact us by completing and submitting the form below. If you are looking for a specif part number, please include it with your message.